I’ve been looking EVERYWHERE for a couple/three cute, interesting wall hooks to put in the nursery. I just need some places to hang her bath hoodie, swaddle blankets, hats. bibs…just things I use throughout the day that I’ve been hanging over the side of the crib or just leaving on top of her changing table, which annoys me because it makes her room look cluttered. 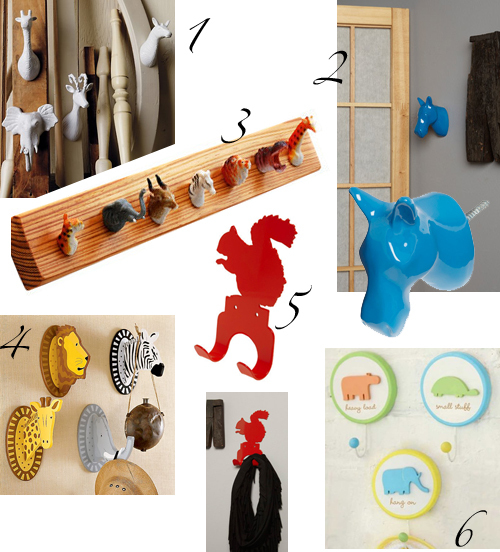 What I really want is a cute alphabet hook, but nothing I’ve found will work with the nursery decor…or is cute enough. So now I’m onto animals, which may be more fun anyway, and I’m seeing a growing trend of giraffe decor everywhere, which is delightful. Here are my possibilities. Which one(s) do you like? This entry was posted in Decorate, Nursery, Round 'Em Up! and tagged decorate, nursery, round 'em up!. Bookmark the permalink.